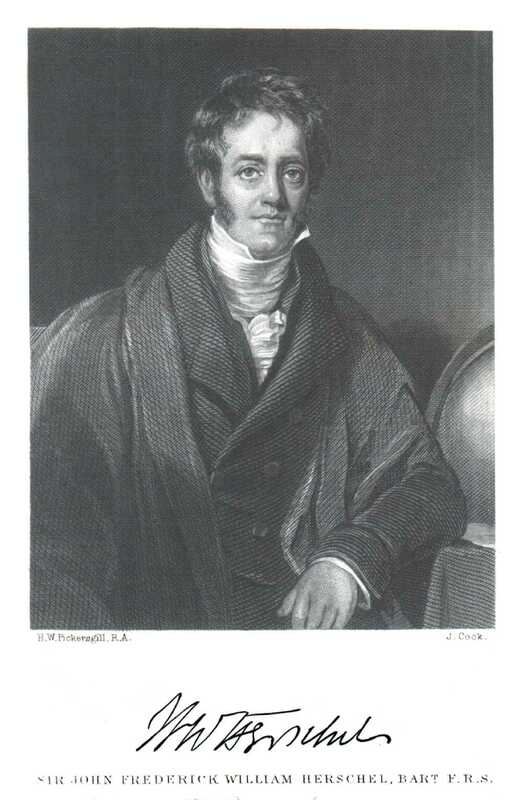 During this week in 1835, an incredible story broke in the Sun Newspaper, New York City, which reported that the famed astronomer Sir John Herschel had made Great Astronomical Discoveries. 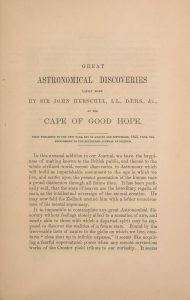 While cataloging and mapping nebulae in the night sky at the Cape of Good Hope, South Africa, Herschel trained his reportedly hyper powerful telescope on the Moon. 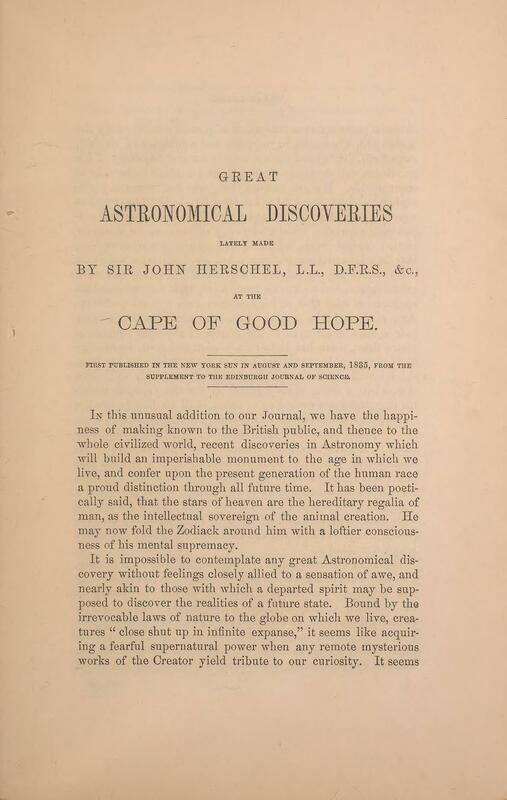 The specifics of the telescope was covered in the first day’s article. 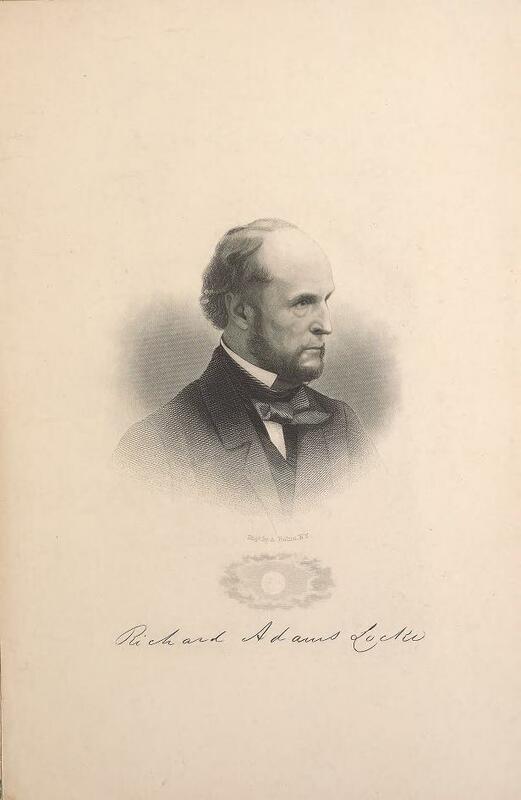 The second day’s article took the reader to the Moon, as it detailed that much to his amazement, Herschel discovered that the Moon was a geological marvel of greenish-brown basaltic (volcanic) rock. Continuing his ocular journey, Herschel found vegetation, which proved that the Moon did indeed have an atmosphere, and could in theory support animal life. The basaltic rock eventually gave way to lunar forests and plains then to crystal clear lakes nestled among mountains. After removing all the enhancing magnifying lenses, Herschel made a broad visual sweep of the Moon’s surface to discover crystalline formations of purple amethyst and what appeared to be obelisks made of this same material, which were lilac in hue and rolling hills of radiant red crystals vermilion or scarlet in coloration. Moving his telescope across the lunar landscape, Herschel happened upon a lush meadow filled with yellow flowers. Much to his amazement he also came upon signs of animal life, the first of which appeared was a brown ox like animal with a singular circular horn, humped shoulders, long shaggy hair, and an appendage over its eyes to protect it from the extremities of light and dark experienced on the lunar surface. 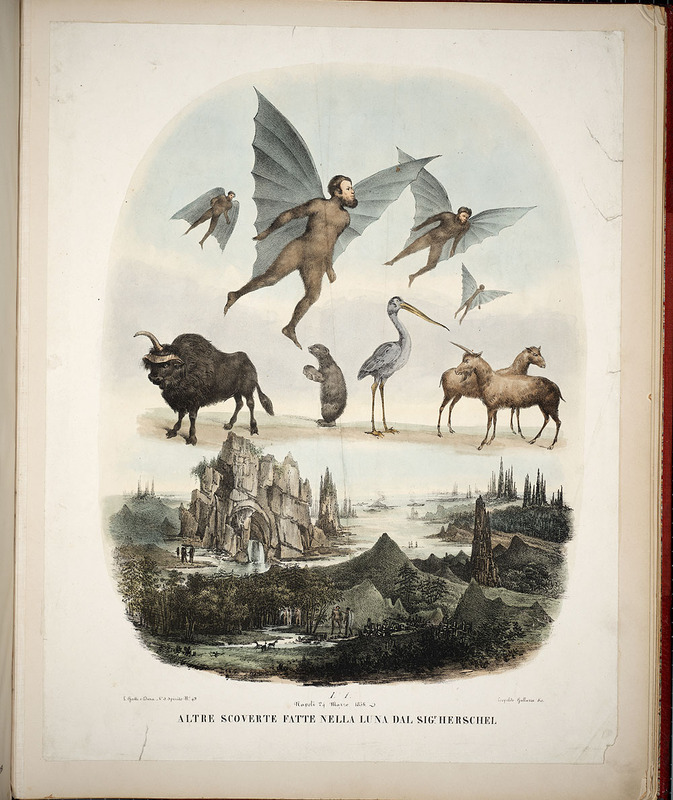 Soon after, he discovered other animal life including birds of all varieties, including cranes, and a monstrous blue goat like animal with the male of the species having a singular horn. When Herschel attempted to touch the projected image of the strange creature, as it danced across the walls of his observatory, the animal darted away seemingly aware of the gaze of the telescope. With the Moon descending before his eyes, Herschel ended his first night of lunar observation. The story was an immediate sensational success, which continued to run throughout the week, with the final article published on August 31. The circulation of the Sun went through the roof and by some accounts made the paper the most widely circulated newspaper in the world, at the time. 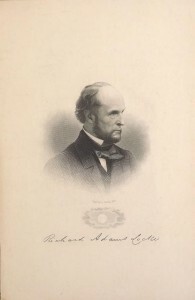 The story gained a life of its own and was reprinted in newspapers throughout the US and Europe and was continuously republished throughout the 19th century. While the guise of the story was one of scientific truth, as discovered by Sir John Herschel and reported in a supplement to the Edinburgh Journal of Science, in reality the story was written by one Richard Adams Locke a writer for the Sun Newspaper who had grand hopes for his ingenious work. Join us as we explore how the story unfolded and what was the true motivation behind the Great Moon Hoax. Read more in Part II and Part III of this blog series. Previous Post Help transcribe a treasure!